Every year some 22,000 ships pass through the Parksluizen locks. But this welter of activity has little effect on road traffic flows as only one of the two bridges on either side of the locks is open at any one time. 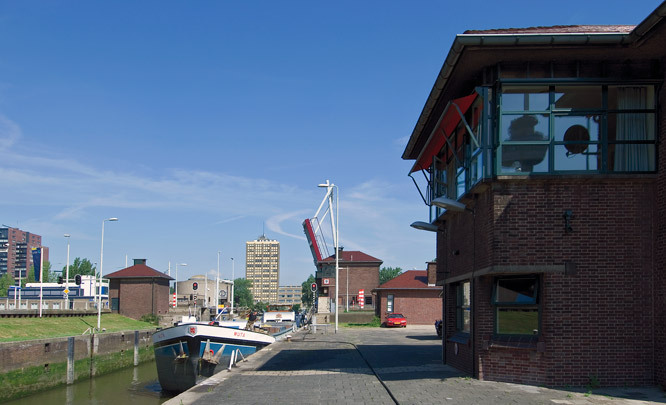 The locks separate the salt water of Nieuwe Maas from the freshwater of the river Schie, and accommodate a difference in level of almost two metres. The many service buildings betray the influence of the architecture of Frank Lloyd Wright. A cylindrical concrete pumping station was built at Coolhaven in 1968, designed by G.J. van der Grinten (Environmental Design) in cooperation with Ingenieursbureau Dwars, Heederik & Verheij.